Socks and sandals, the most controversial combination and the showstopper at Valentino's Resort 2018 fashion show has been cited as the hottest trend of 2017 thanks to the trend setters that are Topshop. Announcing on their blog on Friday, the brand has spoken up on the 'growing movement' of the dreaded sock and sandal combo - thanks Kendall Jenner, who recently stepped on the Cannes red carpet head-to-toe glam paired with metallic heels and a pair of sheer ankle socks. And what was the Internet's response? Sarcasm of course. One Twitter user, Ryan Kautzman joked that socks and sandals are "the only birth control I'll need" while others commented on how she was going to drop out of college because a boy was wearing socks and sandals. It's probably the one thing in fashion, apart from crocs, that causes so much attention, but what is the purpose of socks and sandals. You wear sandals to air your feet out and because they're a summer staple item, not to cover them up and get sweaty feet. Yes, there's a lot of glittery and pretty socks going about and you want to wear them all the time. But socks and sandals are a no no. Why not just treat yourself to a pedicure instead? One thing we will say is that we do love socks paired with heels. It very preppy chic and when paired with the right outfit can be a game changer. 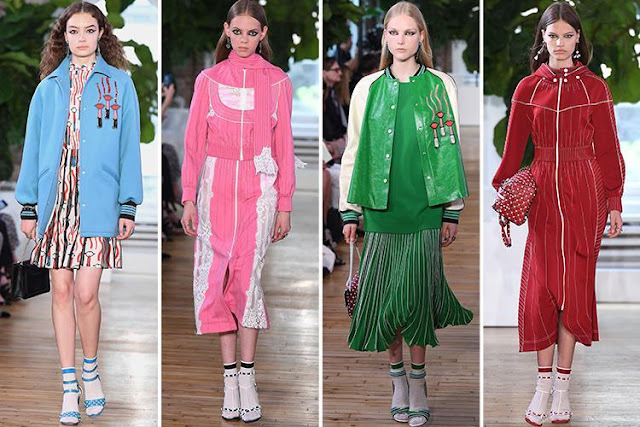 If you're down for this look, then we would say have a look at Valentino's Resort collection from last week. It's the perfect inspo.